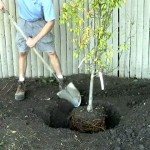 Even if you feel Spring is slipping away and you haven’t planted all you intended, know that it’s not too late to successfully plant container grown trees, shrubs and perennials, and balled and burlapped (B & B) trees and shrubs in your yard. In fact, you can plant throughout the summer, if you follow the planting and maintenance guidelines below. However, transplanting established trees or shrubs or installing bare root plants is best done in spring and fall. Whether you’re installing trees, shrubs or perennials grown in containers or B&B there are two important steps: determining the proper planting depth, and making sure plants get adequate water at time of installation and throughout the summer and fall. Look for the root flare near the soil line—where the trunk of the tree widens into the roots. This will be your new soil line when you plant. For shrubs note the existing soil line. Dig the hole only as deep as necessary to have the root flare level with the soil surface. To prevent the plant from settling too deep, don’t disturb the soil at the bottom of the hole and don’t backfill with loose soil. Dig a saucer-shaped hole 2 to 3 times wider than the root ball. Center the plant in the hole and re-check the depth. Fill the hole around the plant about half full of loose soil, and pack it with your foot or the shovel handle to stabilize the plant. Carefully cut away the twine, wire and burlap from the exposed top of the root ball. Fill the hole around the roots with water and let it drain before filling the rest of the hole with loose soil until it is even with ground level. Pack the soil again and use loose soil to create a basin around the planting hole. This will help capture water you apply as needed throughout the summer. Finally, water generously; filling the basin several times. The same planting guidelines apply to container plants with respect to planting depth and hole size. Determine the position of the root flare or soil line at the top of the container and dig the hole only as deep as needed. Remove the plant from the pot (sometimes challenging, but be patient). With a trowel or your hands loosen the roots; it’s alright to cut the ones that may be circling. From this point, follow the instructions above for installing B&B plants. Building a basin around trees and shrubs helps keep water from running off. As previously mentioned it’s literally a matter of life or death to make sure your new plantings receive regular watering, especially during the first summer and fall. Fill the soil basin or let water drip for an hour to ensure your plants get the water they need. Water when the soil is dry about an inch below the surface. To find that out, simply stick your index finger into the soil up to the first joint. If the tip feels moist, water can wait; if it feels dry, water immediately. Alternatively, you can purchase an inexpensive, easy-to-use moisture meter at The Growing Place, which can be used indoors or outdoors. Most new tree, shrubs or perennials don’t need fertilizing the first year. Having said that, we do recommend Bio-Tone® Starter Plus 4-4-3, a source of organic nutrients and micro-organisms, especially formulated to improve plant establishment. Follow the label instructions for incorporating Bio-Tone at planting. As for mulch, a 2” to 3” layer of mulch around, but not touching, the trunk or stems of new plantings will help retain moisture and look nice, too. With just a little extra care, summer is for planting, too.